A couple of weeks ago me and a good friend of mine Phil, who is is also a photographer decided we would go out somewhere to get some photos. He is not from Doncaster so we don’t get out together as much as we would like too. 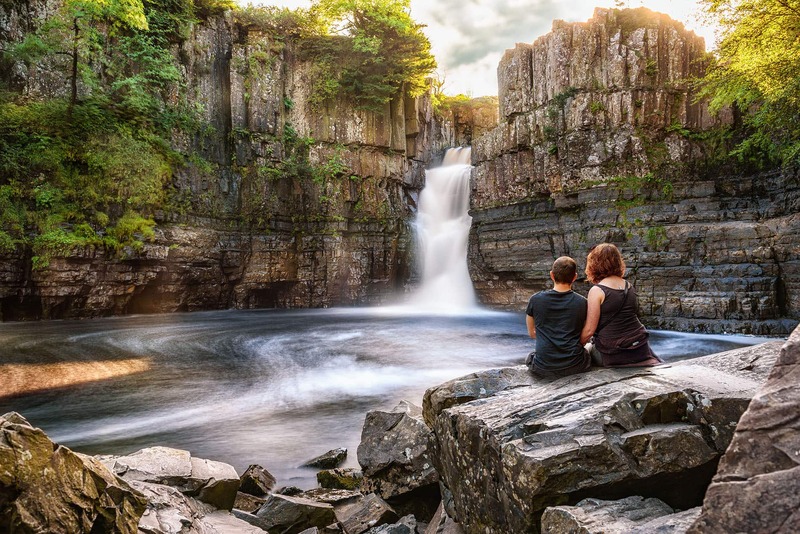 I know there are a lot of cool places up near high force waterfall and it’s not too far from Newcastle city centre too. The plan was to go to the high force waterfall then go straight to Newcastle and get some photos there too. We set off from my house in Doncaster at around 2 pm. It’s a pretty long drive of around 3 hours to Teesdale from Doncaster. On the way there the views were amazing and been photographers, we could have stopped every 5 minutes, but we knew there would be many photographers at high force waterfall so we wanted to get there as soon as possible to get a good spot. When we arrived at Teesdale high force waterfall we were told that we only had 5 minutes as it was soon to be closed for the night. This was a huge shock to us as we thought it would be open all the time and didn’t realise it was gated and closed at all. This was what photographers call, a massive error haha. Usually, we plan every trip very well but we did overlook this small detail which I suppose is easily done. When we were heading down to the waterfall to take photos we literally ran down the track to where the waterfall was. When we saw it we were both amazed how big high waterfall is was. As soon as we arrived I saw a couple sat on a rock enjoying a moment together watching the powerful waterfall, I quickly framed my photo so that they were in it and I took my first photo, right after I had taken that photo they got up and left. I then took the rest of the exposures that I needed to blend together with the image I already had of the couple. I knew straight away that I was going to really enjoy editing this photo. We didn’t really get time after I had taken this photo to take anything else as they told everybody to leave so they could close the gates for the night. Here is the photo again of the photo I had taken after all the editing and blending different exposures. After the photo was edited I thought it would be great to try and find the couple who was in the photo, I thought this might be a very hard task as I could only see the back of them on the photo. So I put the image on Facebook and asked for help sharing the photo to see if I could find the couple. I asked every photographer I know to share it too. After over 1000 shares on Facebook, I finally got a message from The guy in the photos mum who had spotted it and reached out to me, It turns out her mum actually lives in Doncaster which amazed me as I took this photo 3 hours away from my house. When I shared my photo I said if I found them I would give them a free canvas of the photo for them. In the meantime, while I was getting contact details for the couple I had Newcastle’s main radio station call me as they wanted to run a story on my photo, I was over the moon with this news and just shows you the power of social media. 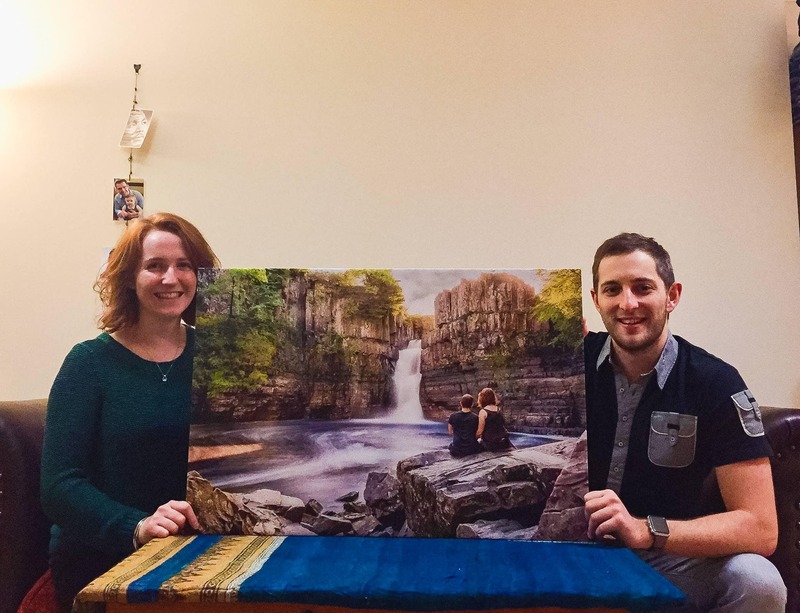 I did eventually get the couples details and sent them a free canvas as promised and here is a picture they sent me when they received it. If you get time I’d love for you to take a look through my landscape photography portfolio here. Have you ever been to this waterfall?